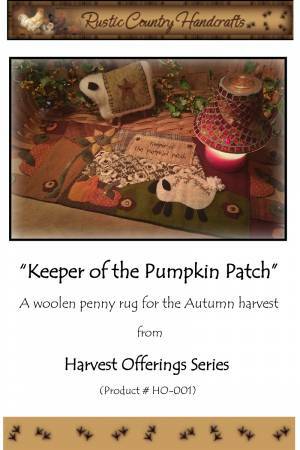 Keeper of the Pumpkin Patch is a whimsical penny rug mat featuring a sheep grazing in a pumpkin patch and flowers. The ends of the runners have wool penny and pumpkin tabs. Runner measures 10-1/2in x 26in.